Select the location(s) for your target audience. Click in the location field every time you want to add another location. Choose the preferred gender(s) for your target audience. 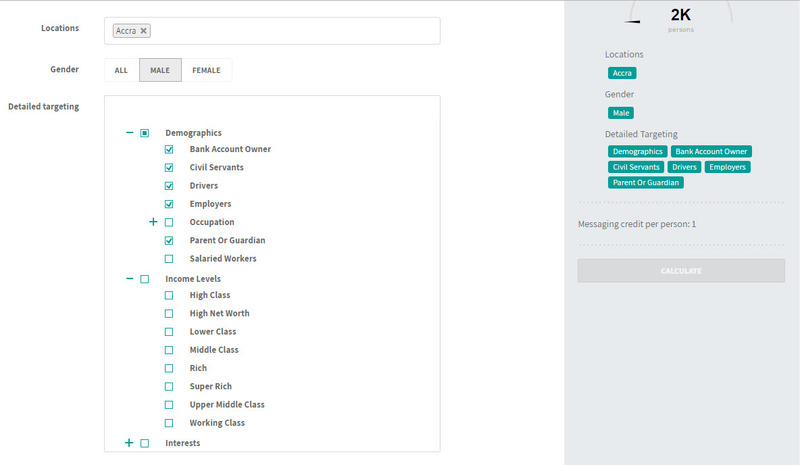 Select the main categories for your detailed targeting by clicking the checkbox next to each one you want to include. Click on the plus icon to view the subcategories. By default, we include all sub categories when you select the main category. You can include and exclude each sub category by clicking on the check boxes. Click on Calculate on the right panel for a count of how many people are in your targeted audience. Once you have decided on who to target, click Next to set your schedule and budget.